Is it just me, or is Rhode Island ready for a change? This image is from Republican Security Council. After reading a stellar profile (that I highly recommend) on Rhode Island’s gubernatorial race, I was reminded of how I had written about their state and the lessons that other blue states can learn from it. It does seem strange, after all, that Republican Allan Fung has kept that race so close. However, given the successes that Republicans in bluer states (such as Larry Hogan, Bruce Rauner, Duke Aiona, Tom Foley, and others) are having, now seemed like a good time to reexamine the lessons of states like Rhode Island. “Why Does CNBC Rank Rhode Island Last For Business? A Major Explanation Is Having Few Elected Republicans. The smallest state once again has the smallest score. Rhode Island hits the bottom of CNBC’s “America’s Top States for Business” rankings for the third time in four years. As the CNBC list demonstrates, states with Republican legislatures and Governors have lower taxes, better economies, lower unemployment and better business rankings. Republicans hold only 6 out of the 75 seats in the State House, and 5 out of 38 seats in the State Senate. CNBC says Rhode Island is an expensive state, finishing 43rd in our all-important Cost of Doing Business category. Rhode Island has the eighth-worst tax burden in the country, and utility costs are high. They have the nation’s highest unemployment rate, an anemic housing market and a less-than-stellar bond rating. “Rhode Island is one of the least free states in the country,” said a 2013 analysis by the Mercatus Center at George Mason University in Arlington, Virginia. We, Marylanders, have much to rejoice after the release of CNBC’s recent release of a study (“America’s Top States For Business 2014) ranking the 50 States on their business climate. Maryland is actually not in last place! For the record, not being dead last is far from something to be proud of, especially with a state with as much potential as ours. Rhode Island seems to be taking after Obama’s foreign policy, and is leading from behind. That is to say that they are stuck with explaining to voters why every other state is ahead of them at a time when the economy is the issue that most elections are going to be hinging on. Why should we care about this? Well, quite frankly, one of the ways that Maryland and Rhode Island are the same is the two States’ monopoly political control by Democrats. Hence, Maryland may be headed to the dead-last spot in business favorability in the next CNBC study. Sure, I’m a little bit biased but the trend is pretty obvious looking at the study in its entirety. The top five have GOP governors, and throughout the list, the states under GOP control post extremely strong ratings. Turning to our beloved Maryland, we’re in the 40s in terms of cost of living, business friendliness, and cost of doing business. These numbers are hardly a resounding success story for Anthony Brown to look back on when he claims he wants to make “a better Maryland for all Marylanders.” Add this to the infamous Gallup poll that has 47% of Marylanders expressing their desire to leave the state if they have the chance, and Brown is already looking pretty weak (to say nothing else of his other failures). Maryland is in the news again, and it’s not for anything to be proud of. Beretta has finally given up, and is leaving for Tennessee, joining the literally thousands of other businesses, large and small, who are so frustrated with our business climate that they have no choice other than to relocate. As Larry Hogan, our next governor, pointed out, Beretta didn’t relocate merely because of our restrictive anti-gun laws. If that were the case, the other thousands of small businesses wouldn’t have fled. In fact, these laws were probably just the icing on the cake that ultimately gave them no choice other than to move. The comparison to Rhode Island reminds me of a line that the GOP County Executive candidate for Montgomery County, Jim Shalleck, said at a debate with his Democratic counterparts: “You can’t blame Republicans” for the countless problems facing our county. This message clearly is a winning one, because after the debate was over, a woman introduced herself to him as a lifelong Democrat, but called him “a breathe of fresh air” and thanked him for running. This is where the comparison to Rhode Island really hits home! 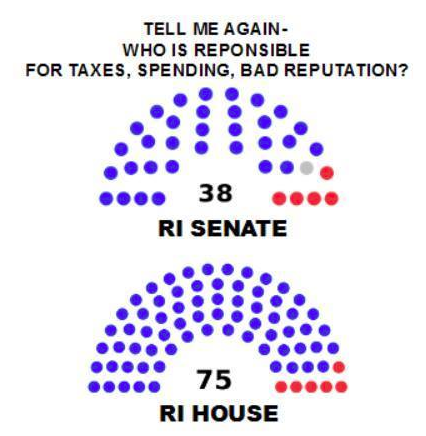 In Rhode Island, only 6 out of 75 members in the State House are Republicans, and only 5 out of 38 in their State Senate are. In Maryland, Democrats control the State legislature – both Houses – with a filibuster proof majority and the few Republican members in Annapolis remain largely powerless as an opposition. Despite having the largest population of registered Republicans in the state, we do not have a single Republican on the County Council or as a State Senate or Delegate representing us in Annapolis. 0 out of 42 is hardly proportional to the sheer number of Republicans who feel voiceless in our county. All of this makes me feel like it’s no coincidence that Rhode Island residents rank their own state as the worst one to live in across America (we Marylanders sadly rank ours as the third worst). Despite all of the inherent difficulties of electing a Republican as governor in Rhode Island, the state’s terrible economic standing makes it worth contesting for Republicans. Despite the fact that Anthony Brown is probably better suited at running for governor of Connecticut, he’s running in Maryland, and it would behoove all of us to learn from Rhode Island by creating a viable two party system in Montgomery County, as well as in the State Legislature and in the Governor’s Mansion this November. Maryland should be leading these lists, not bringing up the rear, and we can begin to turn our state around this November.